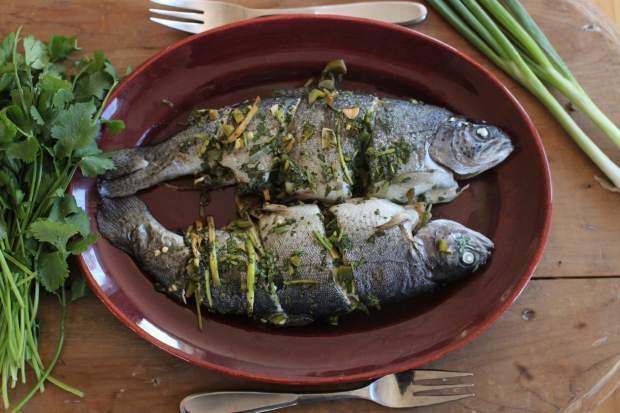 The results of Sara Moulton's recipe for baked whole fish. When buying fish, many of us tend to opt for the ease of fillets. The prospect of buying, prepping and deboning a whole fish might seem not just novel, but also daunting. Ditto for the prospect of steaming a whole fish, a precarious project for even experienced cooks. So here I propose baking your whole fish rather than steaming it and wrapping it in foil to keep it moist. It’s much easier to cook it this way. It also has the added benefit of creating an instant sauce. But let’s start at the beginning. You’re at the store checking out the fish on display. How can you tell if a whole fish is fresh? Its eyes should be clear, not cloudy, and its gills should be brightly colored, red or pink. Once you’ve picked your winner, ask the fishmonger to clean it for you. He’ll clip off the gills, scrape off the scales and remove the guts. If you don’t plan to head home right away, ask for a bag of ice to place next to the fish, which will keep it cold. You begin prepping your fish by scoring it, slicing deeply into the flesh. This will allow the marinade to penetrate to the core and for the fish to cook evenly. I’ve called for traditional Chinese flavorings here, but you’re welcome to adjust them to your tastes. If, for example, you’re not a fan of chilies, leave them out. If you hate cilantro, swap in another fresh herb. The soy sauce is key because it contributes salt as well as flavor, which helps to season the blandish fish. Then after just 20 minutes in the marinade, the fish is ready for the oven. How will you know when it is done? Pull the pan out of the oven, open up the foil carefully (it will be steamy inside), and poke the fish with a small, sharp knife. If the knife slides in easily all the way to the bone, the fish is done. If there’s some resistance, cook it a little longer. When the fish has indeed finished cooking, you’ll be rewarded not only with beautifully fragrant flesh, but also with a store of savory liquid on the bottom of the pan. Carving the fish isn’t a big deal. Begin by gently scraping off the skin from the top of the fish with a knife and discard it. Then, using a spoon and starting at the backbone edge, lift the flesh off in chunks and transfer it to plates. After you have removed the top fillet, you can lift off the bone easily in one piece to expose the bottom fillet. Once cooked, the fillets will come off the bone without a struggle. After you have filleted the fish, ladle some of the cooking liquid over each portion and dig in. It’s a treat any day of the year. Can’t find 1- to 1 1/2-pound whole fish? Buy three smaller ones (about 2⁄3 to 3/4 pound each) and reduce the cooking time to about 15 minutes. Heat the oven to 400 degrees. Line a shallow baking dish large enough to hold both fish with foil. Lay both fish on the counter. Working in 1- to 2-inch intervals, use a sharp knife to slash both sides of each fish perpendicular to the backbone (a 20-degree angle down the rib cage). Transfer the fish to the prepared baking dish. In a small bowl, combine the garlic, ginger, soy sauce, vinegar, sesame oil, chilies, scallions and cilantro. Stuff some of the mixture into each slash on both fish, as well as into the cavity (most of the seasoning should go in the slashes). Cover the pan with foil, and let the fish sit at room temperature for 20 minutes. After 20 minutes, bake the fish on the oven’s middle shelf for 20 to 24 minutes, or until the fish is just cooked through (you can pierce it easily with a knife). To serve, use a small knife to gently scrape off the skin, and then use a spoon to lift off the fillets (they will come up in chunks), and transfer one to each of 4 serving plates. Pour some of the juices from the pan over each portion. Nutrition information per serving: 270 calories; 110 calories from fat (41 percent of total calories); 13 grams fat (3 grams saturated; 0 grams trans fats); 165 milligrams cholesterol; 550 milligrams sodium; 4 grams carbohydrate; 1 gram fiber; 1 gram sugar; 35 grams protein.